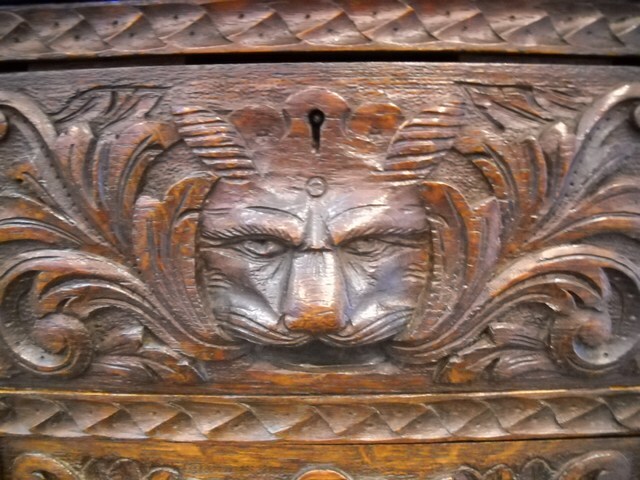 Who is the Green Man Carved into Furniture? 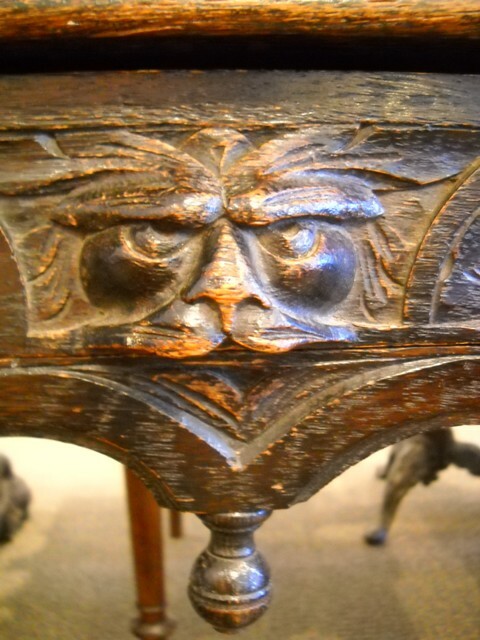 Throughout England, as medieval buildings rose, men carved faces into wood and stone. These small fantastic little men, peeped out from the carved foliage. The faces, in the midst of leaves, have been named the Green Man. Who was this man? Scholars have yet to find the answer. 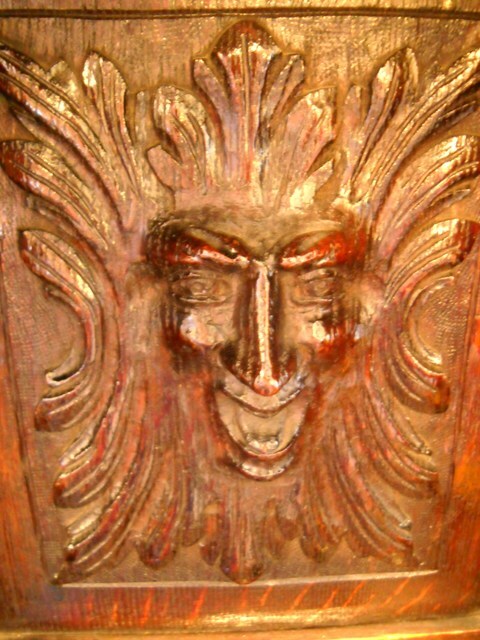 Although the green man appeared in England in the 1100s, carved faces appeared throughout the Roman Empire much earlier. Each medieval mason put their own spin on the faces, which exhibited all kinds of expressions and human feelings. Sometimes they were friendly, other times, they were devilish. In some carvings, the vines and foliage grow out of the nose, eyes, mouth or ears of the men. He represented seasons or simply imaginary creatures. In the 1100’s, only 15 percent of England was still covered with the ancient forests. Instead, land boundaries were thick hedgerows of smaller trees and vines and scattered oaks. The Green Man faces emerged from leaves and vines representative of local flora. The most common leaves are the oaks and the hawthorn. Today, the Green Man can be found in many types of buildings, though primarily the churches, which survived the Reformation. At Rosslyn chapel, over 100 Green Men are carved into the walls. He also appeared on tombs because of the association with resurrection and renewal. 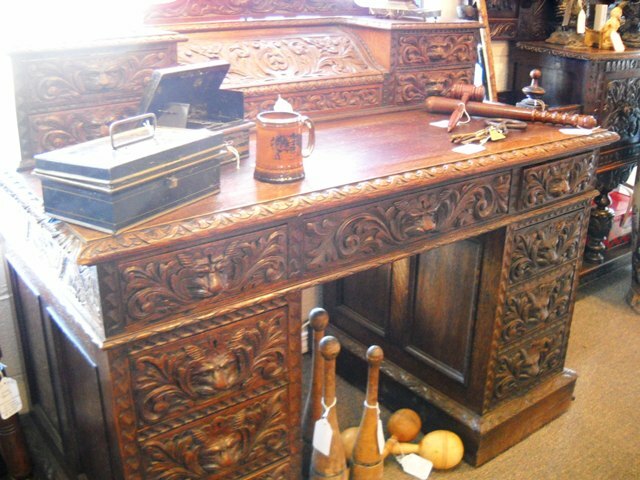 Furniture makers used their chisels to carve the Green Man into English furniture, such as sideboards and desks. 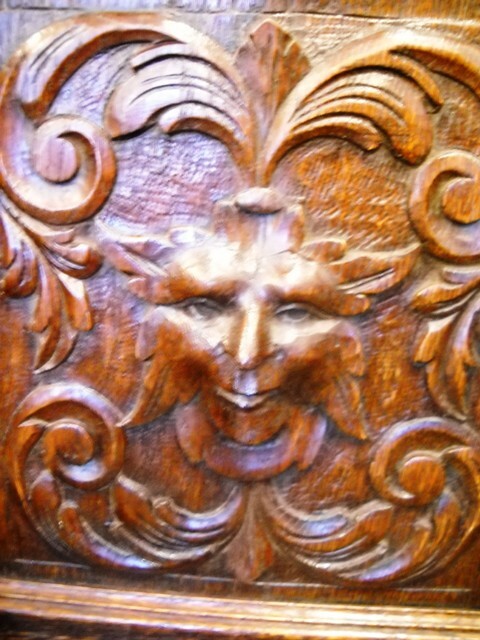 At our antique store, we have several examples of English Revival furniture featuring the Green Man. I’m sorry we wouldn’t be much help besides what we have written on our blog.